Carmen Rossi, J.D. '12, is this year's NIU's Outstanding Young Alumnus Award winner. Rossi achieved his dream of becoming an attorney, but along the way amassed a variety of business interests – residential painting, furniture construction, online marketing, event ticketing and promotion, real estate development and restaurant ownership. That variety of experience was one of the things that piqued the interest of Colin Zvosec, assistant director of membership and special projects at the NIU Alumni Association. Zvosec had never met Rossi before nominating him for the Outstanding Young Alumnus Award, but was fascinated by the College of Law alumnus’ accomplishments. Rossi began several of his small businesses while he was still an undergrad at the University of Illinois Urbana-Champaign. When it came time to choose a law school, he wanted to be near Chicago, but outside the major metropolitan area. 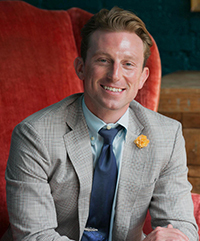 About a year after graduation, Rossi was working for a civil litigation firm when he decided to invest in the Hubbard Inn, a restaurant property in the River North neighborhood of Chicago. Four years later, his restaurant holdings had grown to 13. Two more are scheduled to open this year. Today, his restaurant management company, 8 Hospitality Group, employs more than 900 people. In 2014, Rossi started Chicago Knight Life, which offers meals and companionship to the clients of Chicago-based charities. Employees of 8 Hospitality Group are encouraged to perform volunteer work on a regular basis. Rossi says he always embraced the idea of community, a foundation that was strengthened at NIU. That ability to build and manage relationships is demonstrated by Rossi’s apparent knack for political bridge building. When researching his nomination, Zvosec said he was impressed by evidence that Rossi can work with people on both sides of the aisle. He was appointed by Democratic Chicago Mayor Rahm Emanuel to the City of Chicago Landmark Commission and by former Republican Governor Bruce Rauner to the Illinois Economic Development Board. “He has been nominated to committees by both Republicans and Democrats, which shows he is willing to work with people from a variety of backgrounds in giving back to his community,” Zvosec said. Rossi now splits his time between overseeing his restaurants, real estate development and practicing law in his own law firm, City Lake Law, which focuses on government administrative law and lobbying. He also serves on the boards of several business groups.